It happened within the last hour on June 29, 2014 (Japan time). So far it is only on Twitter and Instagram. A man set himself on fire after making a speech to the passers-by as he sat atop a pedestrian bridge over a busy street in Shinjuku, Tokyo. According to the eyewitness accounts on Twitter, he looked like a regular office worker in suits, and he was expressing his disapproval of the Abe administration and the administration's plan to allow collective self-defense without formally modifying the Constitution by national referendum. I was very surprised that self-immolation like this happened in Japan (of all places) now (of all times) as a political protest (of all things). But I was more surprised to see some tweets (like this, and this, and this) accusing this man of carrying out an act of "terrorism" - setting himself on fire and thus endangering others on a busy street, when freedom of speech and universal suffrage are guaranteed [by the Constitution]. Never mind that the Abe administration's ultimate goal is to gut that Constitution with such niceties. My tweet wondering about those people and their perception of "terrorism" is getting retweeted by people who then spit out "Of course this man is such a nuisance!" People on the street apparently wasted no time in capturing the images with their smartphones. 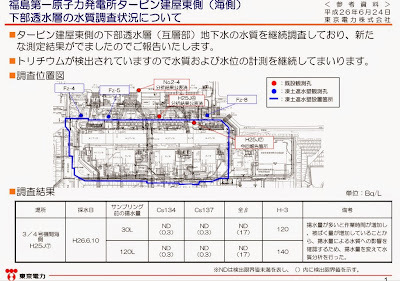 Russia's Fast Breeder Reactor BN-800 at Beloyarsk Nuclear Power Station Reaches Criticality, "Closed Nuclear Fuel Cycle"
If that's the case, Japan's Monju should be learning from Russians, not from French. The BN-800 reactor will be a sodium-cooled fast breeder reactor, under construction now at the Beloyarsk Nuclear Power Station, in Zarechny, Sverdlovsk Oblast, Russia. Designed to generate electrical power of 880 MW in total, the plant will be the final step to the commercial plutonium cycle breeder. It is assumed to start by the end of 2014. By now (2014 June) reactor start-up is in progress. The plant will be a pool-type reactor, where the reactor, coolant pumps, intermediate heat exchangers and associated piping are all located in a common liquid sodium pool. 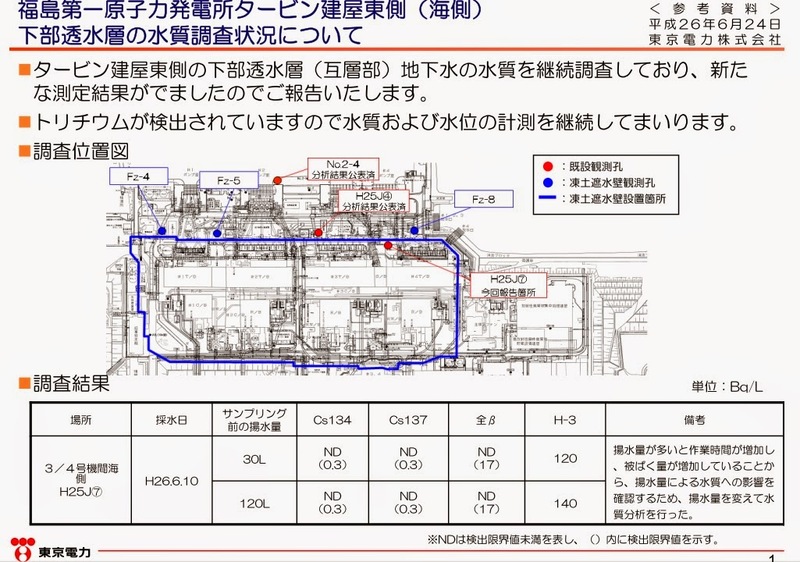 The design of this plant was started in 1983 and was totally revised after the Chernobyl Disaster in 1987 and for somewhat lower degree in 1993 according to the new safety guidelines. After the second revision the electric output power was increased by 10% to 880 MW. The reactor core is very much like in size and mechanical properties to the BN-600 reactor core, but differs very much in the fuel composition. While BN-600 uses medium-enriched uranium dioxide, the new plant will burn mixed uranium-plutonium fuel, helping to reduce the weapon-grade plutonium stockpile and provide information about the functioning of the closed uranium-plutonium fuel cycle. It was specially mentioned that the closed cycle will not require plutonium separation and other chemical processing. Westinghouse Electric Co on Thursday announced it has begun the process of attaining regulatory approval for developing technology that would enable its AP1000 nuclear reactors to be used in locations with higher seismic activity. The company said it started the process of obtaining approval from the U.S. Nuclear Regulatory Commission (NRC) for its 'Specialized Seismic Option' at a meeting on Wednesday. The 'Specialized Seismic Option' being worked on by the company and its majority owner, Toshiba Corp will allow new units to be built in areas with a higher seismic spectrum seen in some portions of the western United States and other countries. Eight units of its AP1000 reactors are being constructed worldwide, including in China and the U.S., the company said. I guess Toshiba wants to be the one-stop total nuclear solution company - from building reactors (AP1000) to soaking up radioactive materials (SARRY, ALPS) after reactors get damaged. "...In addition, customers in more active seismic environments have expressed a strong interest in incorporating this Westinghouse technology into their energy portfolios,” said Jeff Benjamin, Westinghouse senior vice president, Nuclear Power Plants. 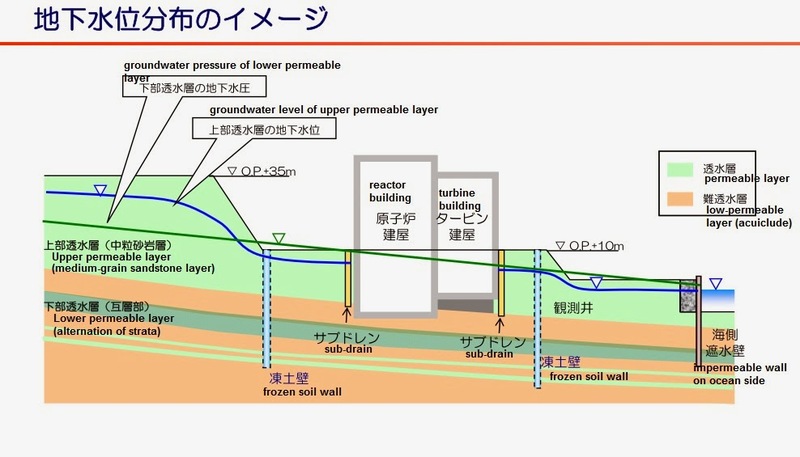 The water was drawn from the lower permeable layer 20-meter deep, according to Kyodo News (6/24/2014) from an observation hole newly dug in preparation for monitoring the frozen soil impermeable wall that is to surround the reactor/turbine buildings of Reactors 1-4. 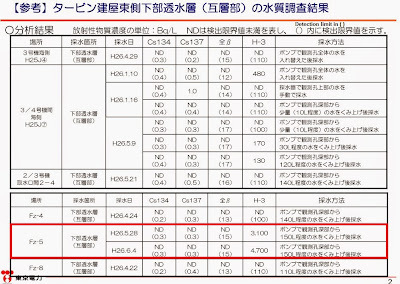 Cesium and all-beta (that includes strontium) are below detection levels, but tritium in 4-digit Bq per liter is apparently not what TEPCO has expected (or so they claim). 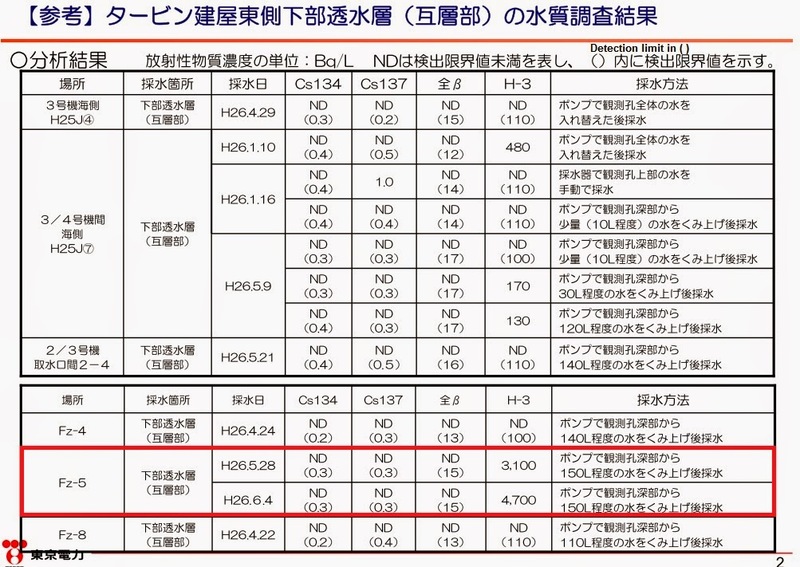 However, the handout also shows the test results for the sample water drawn from the observation holes for future monitoring of the frozen soil impermeable wall (whose construction has just started around the corner of the Reactor 1 building), Fz-4, Fz-5, and Fz-8. English labels are by me, but I don't pretend that I understand what they mean by "groundwater pressure for the lower impermeable layer" (green line in the diagram). 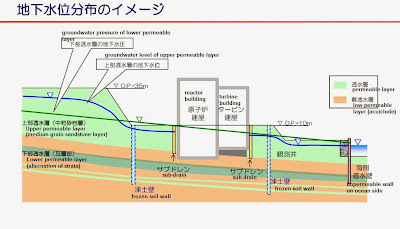 Kyodo News says this will likely delay the construction of the frozen soil impermeable wall because an added work of preventing the spread of contamination is necessary when drilling holes for the frozen soil wall. The holes for the frozen soil wall are to be 30-meter deep. But this is hardly a piece of news, hardly anyone cares, as Japan's politicians, mainstream media and alternative media and social media are abuzz and obssessed with "sexist heckling" by a fifty-something LDP male politician in Tokyo Metropolitan Assembly against a 35-year-old assemblywoman whose former life was a pin-up girl for men's magazine and a minor TV "talento (talent, or personality)".